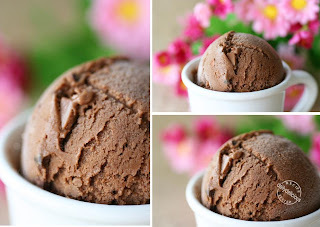 dailydelicious: Dark Chocolate Ice Cream with Cacao Nibs: Ice cream for the chocolate lover! 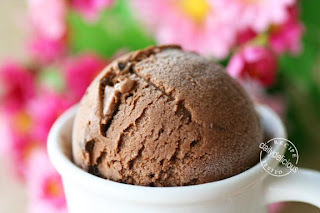 Dark Chocolate Ice Cream with Cacao Nibs: Ice cream for the chocolate lover! 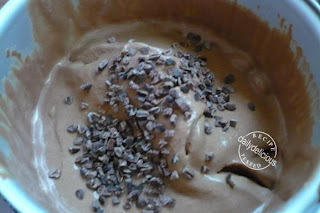 You will say that there are a lot of chocolate ice cream recipes in my blog, well, I can say that there never be enough! ^ ^ As long as I still love chocolate (and yes the ice cream too). This time the chocolate ice cream comes with the cacao nibs (they are tiny bits of roasted cocoa beans). I think the cacao nib is a good way to add the crunchiness to this ice cream. The nib has a bit of bitterness so it will add both contrast in texture and in flavor. It's better the chocolate chip in the way that it very crunchy (some people think that I added the nut into the ice cream), but it tastes like a dark chocolate with very high percentage of the cocoa mass (so, it might be too bitter for some people). 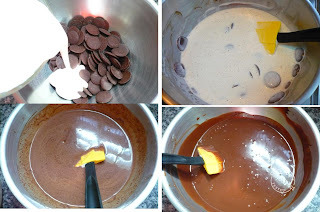 The original recipe uses the milk chocolate, but for me I rarely use the milk chocolate because I found it too sweet so I use the dark chocolate with only 50% of the cocoa mass instead. I don't recommend you to use very high percentage because you will get enough of the bitterness from the cacao nibs, ^ ^. 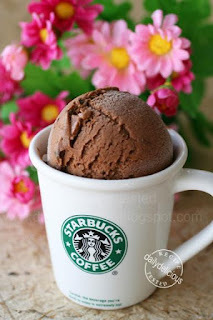 And it's a good recipe, ^ ^, the texture of the ice cream is very good and when talking about the taste, well I must say it's soooooo gooooooood ! 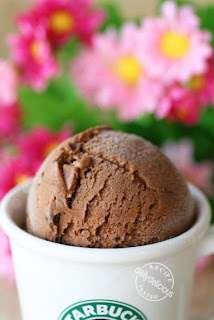 The flavor of the chocolate is very intense and the taste and the crunchiness of the cacao nibs add more charm into this little scoop of the ice cream, so just try it by yourself, this ice cream won't let the chocolate lover down. Bring the cream to boiling point in a small saucepan. Remove form the heat, pour into the chocolate, allow to stand for 1 minute, then stir until smooth and set aside with a fine-meshed strainer nearby. In a saucepan, stir together the egg yolks,with the sugar and salt. Warm the milk and corn syrup in the microwave (about 2-3 minutes) then gradually add some of the warm milk to the egg yolks mixture. Cook the mixture over low heat, stirring and scraping the bottom constantly with a heatproof spatula, just until the custard thickens enough to lightly coat the spatula, 3 to 5 minutes (or about 85 °C). Strain the custard into the milk chocolate mixture and stir together. Chill thoroughly. 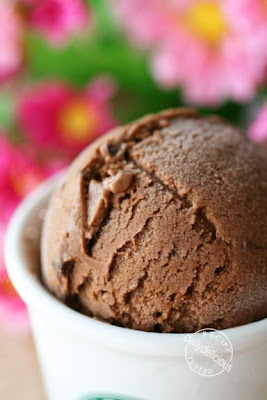 Place the mixture in your ice cream maker and freeze according to the manufacturer's instructions. When ready, pour the chilled mixture into the ice-cream maker and process according to manufacturer’s specifications. Remove the finished ice cream from the ice-cream maker, stir in the cacao nibs .and place in a plastic container. Cover with plastic wrap by pressing the wrap gently against the top of the gelato, affix lid to container, and place in the freezer to fully harden before serving. If I don't have any cocoa nibs can i use dark chocolate chips? Since I don't have an ice cream maker should i add the chocolate chips last? Tomorrow I make Cacao and Lavender Ice cream. I buy 100% cacao cylinders from williescacao.com . The cacao hit is superb as he uses really good beans. We have lots of sun which means lavender sugar. Also rare breed eggs if you can get them , the yolks are much richer (not through any fake additive in the feed). Clarence Court are the real deal, there are some fakes around. I have used www.valrhona.com before its good chocolate. Also 100% cacao with orange zest and cardamom is a favourite. Tomorrow I look at more of your ice cream recipes.